DANVILLE – For most of the second half, the Holly Pond Lady Broncos had tournament host Danville on the ropes Tuesday night in the quarterfinals of the 9th Annual Danville Lady Hawks' Thanksgiving Classic. But in the final 28 seconds, the Lady Hawks escaped the clutches of an upset by Holly Pond and won 54-49 to move on to the semifinals for Wednesday. Danville will get Fairview in a rematch of a semifinal from last year. Before the Holly Pond-Danville clash, Fairview pulled away from West Morgan in the second half by the final of 56-35. Their semifinal will be at 12:40 p.m. with the second semi to be at 2 p.m. between undefeated Athens and once-beaten Jackson-Olin. This would had been a signature victory for new Holly Pond coach Paige Parker-Adams. Her team took an undefeated Danville squad to the finish, but was unable to pull off the upset that would had created a rematch with Fairview in the semis. Holly Pond trailed 13-12 after a quarter and had the game even at 26-26 by halftime. The Lady Broncos went up by seven late in the third, only to see the Lady Hawks score a 3-pointer and close the gap to 37-33 when time expired in the period. The largest lead for the Lady Broncos in the fourth was six points. But Holly Pond missed five free throws in the fourth and several shots from right near the basket. Danville scored a layup with 0:28 left to take a 50-49 lead, then forced a turnover and scored from the foul line for a 52-49 lead and 16 seconds still to play. Ruth Horton had a good look at a three from the right baseline, but missed. Danville again converted at the line with Holly Pond out of timeouts and the upset bid was put away by the tournament host. Horton had her best game of the season with 30 points for the 2-3 Lady Broncos, Taylor Tankersley scored eight, Haley Higginbotham four, Kolby Holcome and Liz Miller two each and Molly Gambrill and Tess Duke one each. Jordan Hinkle scored all nine of her points in the fourth quarter to pace the Danville scoring with Kayla Compton adding eight. The Lady Hawks improved to 4-0. For the second straight year, the Fairview Lady Aggies have earned a berth to the semifinals of the Danville Lady Hawks' Thanksgiving Classic. Tuesday night, the Lady Aggies turned a close game after one quarter against West Morgan to their advantage, running away from the Lady Rebels 56-35. Fairview has won three straight after a loss to Cold Springs last Friday. The Lady Aggies beat Decatur 54-39 in the opening round of the Classic Saturday and followed that with a regular season 52-27 win Monday at Holly Pond. Now they are 7-1 and have made a statement by reaching the Final Four over a pair of Morgan County schools in the ninth edition of this holiday tournament. Leading 8-6 after a quarter, Fairview got the offense clicking with 19 points in the second and had a 27-17 lead when the first half ended. The offense was not as sharp in the third, with seven points. But Fairview put the defense on high alert and held West Morgan to six points, taking a 34-23 lead into the final 8:00 of play. A 16-5 run during the first 6:00 of the fourth sent the Lady Aggies to a 50-28 lead and the game was out of reach. 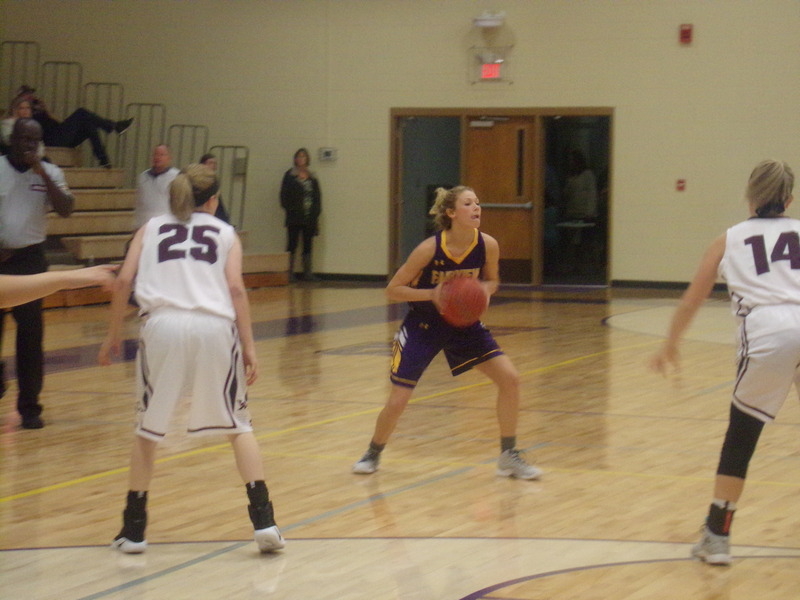 For Mary Hartline's squad, Taylor Yeager scored 14, Jada Golden 13, Abbi Taylor 12, Abby Schnittker seven, McKinna Yearwood and Maci Yeager scored four each and Daiyla Dean two. West Morgan dropped to 1-3 on the season. Leading the Lady Rebels was Bailey Parrish with 10 and Lindsey Goodwin nine. Defending tournament champion Athens prevailed behind a 27-17 advantage that broke a 46-46 tie after the third. This game was close with Athens ahead 20-17 after the first and 31-27 at halftime. Priceville was able to answer and get the game tied during the third before a flurry of points came from the Golden Eagles' attack, sending Athens to 5-0 as they advance to the semifinal round. Japera Harris was tops for the Golden Eagles with 16, Jakayla Bridgeforth had 14 and center Alexis Woods scored 10. Leading 2-2 Priceville was Kathleen Wheeler with 19 and Ashlee Quinn with 18. Athens was coming off a 62-33 regular season victory on Monday at Cullman before resuming the schedule in the Lady Hawks' Classic. The Birmingham team returned to Wayne Bowling Gym and pulled off an upset, handing Brewer its first loss of the season in six games. Brewer led 8-5 after a sluggish first period for both sides. Then Jackson-Olin got hot with a 25-point second period to gain a 30-22 lead at the break. The third period came to a close with the Lady Mustangs leading 45-32 and Brewer unable to overcome the double-digit deficit. Zikina Williams ripped the cords for 22 with Imari Hightower scoring 21 for J-O, now 4-1. Shyan Flack's 12 was tops for the Brewer scoring with Katleyn Childs at 10 and Jace Andrews at nine. Jackson-Olin faces Athens in the second semifinal at 2 p.m.